J Unexplored Med Data 2017;2:39-47.10.20517/2572-8180.2017.03© 2017 OAE Publishing Inc.
Medical Oncology Department, Mid-Western Cancer Centre, University Hospital Limerick, Limerick V94 F858, Ireland. Lung cancer is the leading cause of cancer-related death in the US. In 2015, an estimated 158,040 people will die from lung cancer in this country, accounting for 27% of all cancer deaths. In addition, another 221,200 cases are expected to be newly diagnosed. Although these numbers are declining, only 17% of new cases will survive 5 years post-diagnosis. The 5-year survival rates of advanced or metastatic lung cancers are especially poor; stage IIIB and stage IV tumors are associated with 5-year survival rates of 5% and 1%, respectively. The large majority (80-85%) of lung cancers are non-small cell lung cancers (NSCLCs), with the remaining tumors having small-cell histology. [4-6] Further classification of NSCLC by histologic subtypes such as adenocarcinoma, squamous cell, or large cell carcinoma can provide additional guidance on prognosis and treatment practices. Adenocarcinoma is the most common form of lung cancer in the US. It most commonly occursin a peripheral location and is marked by mucin production, glandular differentiation, or both. Squamous cell carcinoma typically develops centrally, although these tumors can also be found in the periphery of the lung. Tumors are classified as NSCLC large cell carcinoma when they do not exhibit the histologic, cytologic, or immunohistochemical markers of adenocarcinoma, squamous cell carcinoma, or small-cell lung cancer. This review aims to examine the prognostic impact of EGFR mutations in NSCLC patients and compare responses and patient’s survival to different EGFR inhibitor drugs and chemotherapy regimens. EGFR is a member of the ErbB family of receptor tyrosine kinases (RTK). Activation of the receptor initiates a cascade of downstream signaling molecules, leading to cell growth and survival. This process is tightly regulated in non-transformed cells. However, constitutive activation of these pathways leads to dysregulated cell growth and proliferation, angiogenesis, and metastasis, while repressing apoptosis. Genomic damage can introduce mutations that mimic kinase activation or result in higher expression levels of EGFR. Mutations in the tyrosine kinase domain, for example, alter the protein conformation and permit kinase activity. These conditions activate the downstream signaling cascade in the absence of ligand, regardless of negative regulators. Known mechanisms for the oncogenic dysregulation of EGFR include EGFR gene mutation, the overexpression of EGFR protein, and increased gene copy number. In tumors initiated and/or supported by this pathway, the RTK is the predominant activator of downstream signaling, and inhibition of the mutant kinase can suppress signaling, leading to cell arrest. The heterogeneity of NSCLC tumors reflects underlying differences in the natural history of each tumor. Recent advances in understanding the link between histology subtypes and treatment efficacy has improved prognosis for patients with historically difficult-to-treat tumors. [7,13] In particular, characterization of molecular markers in NSCLC (including EGFR mutations) has informed clinical decision making and led to better treatment options for patients with advanced disease. The most common mutations in the EGFR gene associated with NSCLC are an activating point mutation (L858R) in exon 21 and in-frame deletions within exon 19. Together, these mutations account for 85% of EGFR mutations in NSCLC [Figure 1]. Mutations in the EGFR gene are more common in NSCLC tumors with adenocarcinoma histology and in those who never smoked. Female patients and patients with Asian ethnicity are also more likely to have tumors with mutations in the EGFR gene. Oncologists treating patients with NSCLC should know which patients are likely to have EGFR mutations, but testing should not be limited to patients with clinical characteristics or those who fall within certain demographics. Guidelines from several professional societies including the College of American Pathologists, International Association for the Study of Lung Cancer, the Association for Molecular Pathology, and the National Comprehensive Cancer Network recommend that molecular testing be a part of the routine diagnostic tests offered to patients with lung cancer. [9,11] Tumor histology, specifically the presence of adenocarcinoma components, should lead the decision to test for EGFR mutations. All patients who have any component of adenocarcinoma histology should be tested for EGFR mutations. [7,9,11] In addition, patients with squamous histology without a significant smoking history as well as patients with mixed histology or small biopsies for which the precise histologic diagnosis may be difficult should also be tested. Confidence in this histologic diagnosis depends in part on the size of the tissue sample submitted for analysis. For specimens derived from surgical resection, tumor tissue from adenocarcinomas and from mixed lung cancers with an adenocarcinoma component should be tested, regardless of histologic grade. However, EGFR testing is not recommended for resection tissue that lacks any adenocarcinoma component, such as pure small cell carcinomas, pure squamous cell carcinomas, or large cell carcinomas lacking immunohistochemical evidence of adenocarcinoma differentiation. If only a small biopsy specimen was used to assess histology or if the histology is mixed, EGFR mutation testing is not usually recommended in patients with pure squamous cell carcinoma unless the patient has other clinical criteria (e.g. young age, lack of smoking history) that may indicate an underlying EGFR mutation. According to current guidelines, either the primary tumor or a metastatic lesion can be used for EGFR testing, but testing multiple samples from a single tumor is not necessary. Although activating mutations in EGFR have a profound impact on prognosis and treatment strategies, not all mutations within the EGFR gene activate the kinase domain, nor are they all sensitive to approved EGFR tyrosine kinases inhibitors (TKIs). To clarify the difference, EGFR mutations associated with response to EGFR TKIs are called sensitizing mutations. 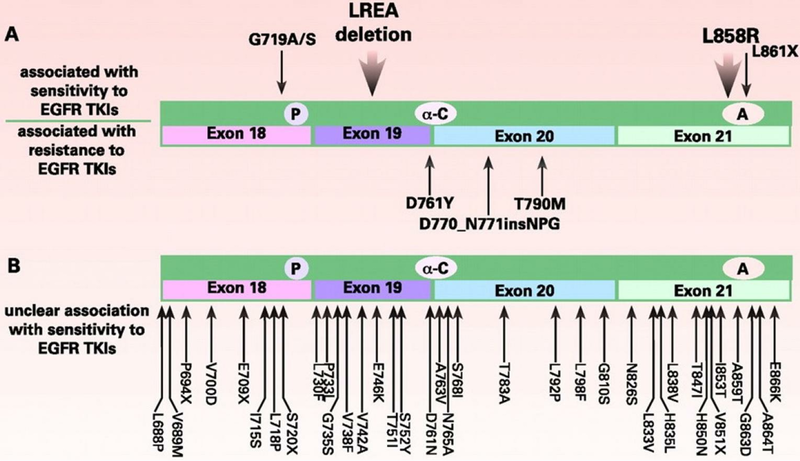 Exon 19 deletions and the L858R mutations are both sensitizing mutations. Tumors may acquire mutations that confer resistance to EGFR TKI therapy, either before or after treatment with these agents.Resistance to EGFR TKIs is associated with exon 20 in-frame insertion mutations and the exon 20 point mutations S768I and T790M, among others. Resistance mutations develop in almost all patients after EGFR TKI treatment due to selective pressure for cancer cells that can grow and divide during therapy. Because of the potential for confusion between sensitizing and resistance mutations in EGFR, reports from EGFR testing analyses should clearly present the results and interpretation for oncologists and non-specialist pathologists. For tumors with sensitizing mutations in EGFR, first-line treatment with EGFR TKIs is associated with higher overall response rates, longer PFS, and better quality of life compared with patients on chemotherapy. [23-26] On the screens that follow, we summarize phase 3 trials that have compared treatment with TKIs and chemotherapy regimens. Gefitinib was first approved by the US FDA in 2003 as monotherapy for patients with locally advanced or metastatic NSCLC after failure of both platinum-based and docetaxel therapies. However, the impact on overall survival remained unproven and, as a result, the FDA limited its indication to the continued treatment of patients with locally advanced or metastatic NSCLC after failure of both platinum-based and docetaxel chemotherapies who were benefiting or had benefited from gefitinib. In July 2015, new data led to the FDA approval of gefitinib for first-line treatment in patients with NSCLC whose tumors harbor the EGFR exon 19 deletion or exon 21 substitution mutations. This approval was based on a study in which a total of 106 patients with previously untreated, EGFR mutation-positive metastatic NSCLC were treated with 250 mg of gefitinib once daily. The primary endpoint of the study was objective response rate, and results showed that tumors shrank in about 50% of patients after treatment, an effect that lasted an average of 6 months. Response rates were similar in patients whether their tumor had the exon 19 deletion or the exon 21 substitution. A retrospective analysis of another clinical trial reviewed the data of 186 patients who received first-line gefitinib or up to 6 cycles of carboplatin plus paclitaxel. The results suggested an improvement in PFS for patients in the gefitinib group. In addition, the FDA approved a companion diagnostic test to guide the use of gefitinib in the treatment of patients with advanced NSCLC. This EGFR real-time polymerase chain reaction kit can help identify patients with tumors that have the EGFR mutation and enable clinicians to determine which patients are appropriate for gefitinib treatment. In the large, open-label, parallel-group study Iressa Pan-Asia Study (IPASS), 1,217 patients with stage IIIB or IV NSCLC with histologic features of adenocarcinoma who were nonsmokers or former light smokers were randomized to receive gefitinib or carboplatin plus paclitaxel. [24,29] Study participants were enrolled from 87 centers in Singapore, Hong Kong, China, Taiwan, Malaysia, Japan, Philippines, and Thailand. This trial met its primary endpoint of noninferiority of the difference in PFS between the 2 study groups. The median PFS was 5.7 months in the gefitinib group and 5.8 months in the carboplatin-paclitaxel group [Table 1]. Gefitinib was associated with higher rates of PFS at 12 months (24.9% vs. 6.7% with carboplatin-paclitaxel, respectively), higher objective response rates (71.2% vs. 47.3% with carboplatin-paclitaxel, respectively; P < 0.001), and fewer grade 3 or 4 adverse events (28.7% vs. 61.0% with carboplatin-paclitaxel, respectively). Subgroup analyses indicated that the benefit of gefitinib relative to chemotherapy was dependent on the mutation status of the patient. Gefitinib was associated with longer PFS in patients with tumors positive for EGFR mutation or of unknown EGFR mutation status, but was inferior to chemotherapy in participants without sensitizing EGFR mutations. An updated analysis for overall survival (OS) later found no statistical difference between gefitinib and carboplatin. The median OS was 18.8 months vs. 17.4 months for gefitinib and carboplatin-paclitaxel, respectively; the median follow-up was 17.0 months. However, a substantial proportion (64.3%) of study participants who received first-line chemotherapy received TKIs after their randomly assigned treatment. This crossover population may have confounded the effect of first-line treatment on OS. A smaller study, the open-label, parallel-group, randomized, multicenter, phase 3 First-SIGNAL, evaluated the efficacy, safety, and quality of life of gefitinib treatment compared with gemcitabine-cisplatin chemotherapy in never-smoker Korean patients with stage IIIB or IV lung adenocarcinoma. The 309 study participants received first-line gefitinib or chemotherapy. As in IPASS, participants were able to receive additional therapies after discontinuation of the first-line therapy; 65% of those randomized to the gefitinib group received platinum-based chemotherapy, whereas 75% of those randomized to the gemcitabine-cisplatin group later received an EGFR TKI. Median OS, the primary endpoint, was 22.3 months and 22.9 months in the gefitinib and gemcitabine-cisplatin arms, respectively, during a median follow-up of 35 months [Table 2]. The difference between the 2 groups was not significant. Analysis of PFS also failed to demonstrate a significant difference between the study treatments. The incidence of grade 3 or 4 adverse events was significantly lower in the gefitinib group than it was in the gemcitabine-cisplatin group (P < 0.001). The open-label, randomized, multicenter, phase 3 trial WJTOG 3405 compared first-line gefitinib with cisplatin-docetaxel in Japanese patients with advanced or recurrent NSCLC that harbored activating EGFR mutations. Among the modified intent-to-treat population (n = 172), the gefitinib group had longer median PFS of 9.2 months vs. 6.3 months in the cisplatin-docetaxel group. Subgroup analyses confirmed this trend in longer PFS for participants receiving gefitinib regardless of gender, smoking history, tumor stage, and whether the EGFR mutation was the exon 19 deletion or the L858R substitution. The gefitinib group experienced a higher incidence of grade 3 or higher increases in alanine aminotransferase (ALT) or aspartate aminotransferase (AST), whereas the chemotherapy regimen was associated with grade 3 or higher neutropenia, leukocytopenia, and anemia. Similarly, the multicenter, randomized, phase 3 NEJGSG 002 trial evaluated the efficacy and safety of gefitinib and carboplatin-paclitaxel in Japanese patients with advanced NSCLC and sensitizing EGFR mutations. A total of 224 participants were included in the intent-to-treat population. Gefitinib treatment was associated with longer PFS than carboplatin-paclitaxel (10.8 months vs. 5.4 months, respectively) in the intent-to-treat population. There was no significant PFS difference between patients with the exon 19 deletion and those with the L858R point mutation. Although patients receiving first-line gefitinib had a numerically longer OS, statistical significance was not reached; 95% of those in the carboplatin-paclitaxel group crossed over to receive gefitinib therapy. The most common adverse events were rash and elevated levels of AST or ALT in the gefitinib group and appetite loss, neutropenia, anemia, and sensory neuropathy in the chemotherapy group. Erlotinib is US FDA approved for the first-line treatment of patients with metastatic NSCLC whose tumors have EGFR exon 19 deletions or L858R substitution mutations as detected by an FDA-approved test; as maintenance treatment for patients with locally advanced or metastatic NSCLC whose disease has not progressed after 4 cycles of platinum-based, first line chemotherapy; and as treatment for locally advanced or metastatic NSCLC after failure of at least 1 prior chemotherapy regimen. When used in the first-line setting in patients with EGFR sensitizing mutations, erlotinib has been associated with longer PFS than standard chemotherapy. The OPTIMAL trial was a phase 3, open-label, randomized study performed in China. The study enrolled 165 participants with advanced or recurrent stage IIIB or IV NSCLC with confirmed activating mutations in EGFR, of whom 154 were included in the PFS analysis. Study participants who received erlotinib had longer mean PFS than those who received chemotherapy [Table 3]. The most common grade 3 or 4 adverse events reported in the erlotinib group were increases in ALT concentrations and skin rash. Subgroup analyses demonstrated consistent PFS benefit regardless of gender, age, histology, or smoking history. The hazard ratio (HR) for PFS differences between erlotinib and chemotherapy for those with EGFR exon 19 mutations was 0.13 (95% CI: 0.07-0.28) and 0.26 (95% CI: 0.14-0.49) for those with exon 21 mutations (i.e. L858R). The most common grade 3/4 adverse events in participants receiving chemotherapy included neutropenia and thrombocytopenia. The EURTAC study, performed in France, Italy, and Spain, had a similar study design to OPTIMAL, with an open-label, multicenter, randomized design to assess the safety and efficacy of erlotinib in patients with stage IIIB (with pleural effusion) or stage IV NSCLC. The 173 enrolled and randomized study participants received first-line erlotinib or standard chemotherapy of cisplatin plus docetaxel or gemcitabine. The median PFS was 9.7 months in the erlotinib group and 5.2 months in the chemotherapy group. In subgroup analyses, erlotinib was associated with significantly longer PFS than chemotherapy regardless of smoking history. The difference between treatments was also significant between erlotinib and chemotherapy regimens among patients with EGFR exon 19 deletions (HR 0.30, 95% CI: 0.18-0.50; P < 0.0001), but not in patients with the L858R point mutation (HR 0.55, 95% CI: 0.29-1.02; P = 0.0539). At the final data cut off, OS was not significantly different between treatment groups); 76% of first-line chemotherapy patients crossed over to receive EGFR TKIs. The most common grade 3 or 4 adverse events in the erlotinib group were rash and increased ALT concentrations, and anemia and neutropenia were observed in the chemotherapy group. Afatinib has been associated with a PFS benefit over chemotherapy in the first-linesetting. [32,33] As an irreversible inhibitor, afatinib has different pharmacokinetics than erlotinib and gefitinib. The LUX-Lung 3 and LUX-Lung 6 trials compared afatinib with chemotherapy regimens in patients with NSCLC and proven EGFR mutations. [32,33] A post-hoc analysis of LUX-Lung 2, 3, and 6 trials found that afatinib is active in patients with uncommon EGFR mutations - in particular, G719S, L861Q, and S768I. In this study, afatinib was compared against cisplatin-pemetrexed in the LUX-Lung 3 trial. [32,34] Three hundred forty-five study participants who had advanced lung adenocarcinoma with proven EGFR mutation were randomized to receive either first-line afatinib or cisplatin-pemetrexed in this open-label, randomized, global phase 3 study. The median PFS was 11.1 months and 6.9 months in the afatinib and cisplatin-pemetrexed groups, respectively [Table 4]. A subgroup analysis of PFS by stratified characteristics found persistent benefit regardless of age, gender, race, and performance status, although the number of patients with certain characteristics was too low for meaningful conclusions. Adverse events that occurred during the trial included diarrhea, rash/acne, and stomatitis/mucositis in the afatinib group and nausea, decreased appetite, and fatigue in the chemotherapygroup. [32,35] There were 4 patient deaths during the course of the study that were considered to be possibly related to the study drug. Of note, high interpatient variability was observed in afatinib plasma levels among study participants, and dose modifications were required to lower excessive afatinib levels. In the follow-up trial LUX-Lung 6, the efficacy and safety of afatinib were compared with gemcitabine-cisplatin in a randomized, open-label, phase 3 trial conducted in China, Thailand, and South Korea. LUX-Lung 6 enrolled 364 participants with untreated stage IIIB (with pleural effusion) or IV lung adenocarcinoma that was positive for EGFR mutations. Investigators evaluated the study participants’ tumors for EGFR mutations, including but not limited to the L858R point mutation or deletions in exon 19. Median PFS was longer in the afatinib group than it was in the gemcitabine-cisplatin regimen: 11.0 months vs. 5.6 months. Subgroup analysis by EGFR mutation demonstrated that PFS was similar for the two common mutations (exon 19 deletions and L858R). Adverse events in the afatinib group were rash or acne, diarrhea, and stomatitis or mucositis; in the chemotherapy group, the most common adverse events were neutropenia, vomiting, and leucopenia. Investigators analyzed the effect of afatinib on OS in patients with EGFR mutation-positive adenocarcinoma who participated in LUX-Lung 3 and LUX-Lung 6. In this combined analysis, there was a significant OS benefit in favor of afatinib relative to chemotherapy (27.3 months vs. 24.3 months; 95% CI: 0.66-0.99; P = 0.037). This was largely driven by the significant benefit in OS observed in patients with exon 19 deletions. In the LUX-Lung 3 trial, median OS was 33.3 months (95% CI: 26.8-41.5) in the afatinib group compared with 21.1 months (95% CI: 16.3-30.7) in the chemotherapy group (HR 0.54, 95% CI: 0.36-0.79; P = 0.0015), and in the LUX-Lung 6trial, it was 31.4 (95% CI: 24.2-35.3) vs. 18.4 months (95% CI: 14.6-25.6), respectively (HR 0.64, 95% CI: 0.44-0.94; P = 0.023). By contrast, there were no significant differences by treatment group for patients with EGFR exon 21 L858R mutation. The investigational oral drug AZD9291 is an EGFR TKI that has shown activity against sensitizing EGFR mutations. In 2015, findings from a phase 1 expansion cohort that enrolled 60 patients were presented at the American Society of Clinical Oncology annual meeting. The study was designed to assess this agent’s safety, tolerability, and anticancer activity in the first-line EGFR mutation treatment setting. One-half of the study participants received the 80 mg/day dosage, and the other half received the 160 mg/day dosage. The objective response rate was 73% (95% CI: 60-84), and 3- and 6-month PFS rates were 93% (95% CI: 83-97) and 87% (95% CI: 75-93), respectively. Among both cohorts, only 1 patient experienced a grade 3 skin rash, and 2 patients experienced diarrhea. Because AZD9291 has demonstrated a promising anticancer activity for first-line treatment of EGFR mutated advanced NSCLC with a manageable tolerability profile, a phase 3 study comparing it with erlotinib or gefitinib is underway. Lung cancer remains the leading cause of cancer deaths in the US. In patientswith sensitizing mutations, new treatments such as EGFR TKIs offer superior PFS benefit to carefully selected patients; a recent combined analysis of the two LUX-Lung trials has shown an OS benefit, although this has not been proven in other trials due to the high percentage of cross-over patients in phase 3 trials. Research in the underlying causes of tumor types, particularly in patients without a history of smoking, has identified key mutations that predict sensitivity to therapy with EGFR TKIs. Accurate testing methods are necessary to identify patients who would most likely respond to these treatments. The authors contributed equally to the study. 1. American Cancer Society. Cancer Facts & Figures 2015. Atlanta: American Cancer Society; 2015. Available from: https://www.cancer.org/research/cancerfactsstatistics/cancerfactsfigures2015/. [Last accessed on December 20, 2016]. 2. National Cancer Institute. SEER Stat Fact Sheets: Lung and Bronchus Cancer. Available from: http://seer.cancer.gov/statfacts/html/lungb.html. [Last accessed on December 20, 2016]. 3. American Cancer Society. Non-Small Cell Lung Cancer Survival Rates by Stage. 2015. Available from: https://www.cancer.org/cancer/non-small-cell-lung-cancer/detection-diagnosis-staging/survival-rates.html. [Last accessed on December 20, 2016]. 4. Warth A, Muley T, Meister M, Stenzinger A, Thomas M, Schirmacher P, Schnabel PA, Budczies J, Hoffmann H, Weichert W. The novel histologic International Association for the Study of Lung Cancer/American Thoracic Society/European Respiratory Society classification system of lung adenocarcinoma is a stage-independent predictor of survival. J Clin Oncol 2012;30:1438-46. 5. Fong KM, Bowman R, Fielding D, Abraham R, Windsor M, Pratt G; QILCOP steering committee. Queensland integrated lung cancer outcomes project (qilcop): initial accrual and preliminary data from the first 30 months. Respirology 2003;8:A53. 6. Davidson MR, Gazdar AF, Clarke BE. The pivotal role of pathology in the management of lung cancer. J Thorac Dis 2013;5:S463-78. 7. Travis WD, Brambilla E, Noguchi M, Nicholson AG, Geisinger KR, Yatabe Y, Beer DG, Powell CA, Riely GJ, Van Schil PE, Garg K, Austin JH, Asamura H, Rusch VW, Hirsch FR, Scagliotti G, Mitsudomi T, Huber RM, Ishikawa Y, Jett J, Sanchez-Cespedes M, Sculier JP, Takahashi T, Tsuboi M, Vansteenkiste J, Wistuba I, Yang PC, Aberle D, Brambilla C, Flieder D, Franklin W, Gazdar A, Gould M, Hasleton P, Henderson D, Johnson B, Johnson D, Kerr K, Kuriyama K, Lee JS, Miller VA, Petersen I, Roggli V, Rosell R, Saijo N, Thunnissen E, Tsao M, Yankelewitz D. International association for the study of lung cancer/american thoracic society/european respiratory society international multidisciplinary classification of lung adenocarcinoma. J Thorac Oncol 2011;6:244-85. 8. Kris MG, Johnson BE, Berry LD, Kwiatkowski DJ, Iafrate AJ, Wistuba II, Varella-Garcia M, Franklin WA, Aronson SL, Su PF, Shyr Y, Camidge DR, Sequist LV, Glisson BS, Khuri FR, Garon EB, Pao W, Rudin C, Schiller J, Haura EB, Socinski M, Shirai K, Chen H, Giaccone G, Ladanyi M, Kugler K, Minna JD, Bunn PA. Using multiplexed assays of oncogenic drivers in lung cancers to select targeted drugs. JAMA 2014;311:1998-2006. 9. Ettinger DS, Wood DE, Akerley W, Bazhenova LA, Borghaei H, Camidge DR, Cheney RT, Chirieac LR, D'Amico TA, Demmy TL, Dilling TJ, Dobelbower MC, Govindan R, Grannis FW Jr, Horn L, Jahan TM, Komaki R, Krug LM, Lackner RP, Lanuti M, Lilenbaum R, Lin J, Loo BW Jr, Martins R, Otterson GA, Patel JD, Pisters KM, Reckamp K, Riely GJ, Rohren E, Schild SE, Shapiro TA, Swanson SJ, Tauer K, Yang SC, Gregory K, Hughes M; National comprehensive cancer network. Non-Small Cell Lung Cancer, Version 6. 2015. J Natl Compr Canc Netw 2015;13:515-24. 10. Leighl NB, Rekhtman N, Biermann WA, Huang J, Mino-Kenudson M, Ramalingam SS, West H, Whitlock S, Somerfield MR. Molecular testing for selection of patients with lung cancer for epidermal growth factor receptor and anaplastic lymphoma kinase tyrosine kinase inhibitors: American Society of Clinical Oncology endorsement of the College of American Pahtologists/International Association for the Study of Lung Cancer/Association for Molecular Pathology guideline. J Clin Oncol 2014;32:3673-9. 11. Lindeman NI, Cagle PT, Beasley MB, Chitale DA, Dacic S, Giaccone G, Jenkins RB, Kwiatkowski DJ, Saldivar JS, Squire J, Thunnissen E, Ladanyi M; College of American Pathologists International Association for the Study of Lung Cancer and Association for Molecular Pathology. Molecular testing guideline for selection of lung cancer patients for EGFR and ALK tyrosine kinase inhibitors: guideline from the College of American Pathologists, International Association for the Study of Lung Cancer, and Association for Molecular Pathology. J Mol Diagn 2013;15:415-53. 12. da Cunha Santos G, Shepherd FA, Tsao MS. EGFR mutations and lung cancer. Annu Rev Pathol 2011;6:49-69. 13. Sharma SV, Settleman J. Oncogene addiction: setting the stage for molecularly targeted cancer therapy. Genes Dev 2007;21:3214-31. 14. Revannasiddaiah S, Thakur P, Bhardwaj B, Susheela SP, Madabhavi I. Pulmonary adenocarcinoma: implications of the recent advances in molecular biology, treatment and the IASLC/ATS/ERS classification. J Thorac Dis 2014;6:S502-25. 15. Korpanty GJ, Graham DM, Vincent MD, Leighl NB. Biomarkers that currently affect clinical practice in lung cancer: EGFR, ALK, MET, ROS-1, and KRAS. Front Oncol 2014;4:204. 16. Cote ML, Haddad R, Edwards DJ, Atikukke G, Gadgeel S, Soubani AO, Lonardo F, Bepler G, Schwartz AG, Ethier SP. Frequency and type of epidermal growth factor receptor mutations in African Americans with non-small cell lung cancer. J Thorac Oncol 2011;6:627-30. 17. Karachaliou N, Mayo-de las Casas C, Queralt C, de Aguirre I, Melloni B, Cardenal F, Garcia-Gomez R, Massuti B, Sánchez JM, Porta R, Ponce-Aix S, Moran T, Carcereny E, Felip E, Bover I, Insa A, Reguart N, Isla D, Vergnenegre A, de Marinis F, Gervais R, Corre R, Paz-Ares L, Morales-Espinosa D, Viteri S, Drozdowskyj A, Jordana-Ariza N, Ramirez-Serrano JL, Molina-Vila MA, Rosell R; Spanish Lung Cancer Group. Association of EGFR L858R mutation in circulating free DNA with survival in the EURTAC trial. JAMA Oncol 2015;1:149-57. 18. Sequist LV, Goldman JW, Wakelee HA, Camidge DR, Chao BH, Despain D, Karlovich CA, Liu SV, Ou SHI, Oxnard GR, Papadimitrakopoulou V, Piotrowska Z, Reckamp KL, Soria JC, Solomon B, Spira AI, Varga A, Yu HA, Yurasov S. Efficacy of rociletinib (CO-1686) inplasma-genotyped T790M-positive non-small-cell lung cancer patients. J Clin Oncol 2015;33 suppl:abstr 8001. 19. Peters S, Zimmermann S, Adjei AA. Oral epidermal growth factor receptor tyrosine kinase inhibitors for the treatment of non-small cell lung cancer: comparative pharmacokinetics anddrug-drug interactions. Cancer Treat Rev 2014;40:917-26. 20. Gilotrif [package insert]. Ridgefield, CT: Boehringer Ingelheim Pharmaceuticals, Inc.; 2015. Available from: http://docs.boehringer-ingelheim.com/Prescribing%20Information/PIs/Gilotrif/Gilotrif.pdf. [Last accessed on June 26, 2017]. 21. Iressa [package insert]. Cheshire, United Kingdom: Astra Zeneca; 2015. Available from: https://www.accessdata.fda.gov/drugsatfda_docs/label/2015/206995s000lbl.pdf. [Last accessed on June 26, 2017]. 22. Tarceva [package insert]. San Francisco, CA: Genentech USA, Inc, A Member of the Roche Group; 2015. Available from: https://www.gene.com/download/pdf/tarceva_prescribing.pdf. [Last accessed on June 26, 2017]. 23. Han JY, Park K, Kim SW, Lee DH, Kim HY, Kim HT, Ahn MJ, Yun T, Ahn JS, Suh C, Lee JS, Yoon SJ, Han JH, Lee JW, Jo SJ, Lee JS. First-SIGNAL: first-line single-agent iressa versus gemcitabine and cisplatin trial in never-smokers with adenocarcinoma of the lung. J Clin Oncol 2012;30:1122-8. 24. Mok TS, Wu YL, Thongprasert S, Yang CH, Chu DT, Saijo N, Sunpaweravong P, Han B, Margono B, Ichinose Y, Nishiwaki Y, Ohe Y, Yang JJ, Chewaskulyong B, Jiang H, Duffield EL, Watkins CL, Armour AA, Fukuoka M. Gefitinib or carboplatin-paclitaxel in pulmonary adenocarcinoma. N Engl J Med 2009;361:947-57. 25. Mitsudomi T, Morita S, Yatabe Y, Negoro S, Okamoto I, Tsurutani J, Seto T, Satouchi M, Tada H, Hirashima T, Asami K, Katakami N, Takada M, Yoshioka H, Shibata K, Kudoh S, Shimizu E, Saito H, Toyooka S, Nakagawa K, Fukuoka M; West Japan Oncology Group. Gefitinib versus cisplatin plus docetaxel in patients with non-small-cell lung cancer harbouring mutations of the epidermal growth factor receptor (WJTOG3405): an open label, randomised phase 3 trial. Lancet Oncol 2010;11:121-8. 26. Maemondo M, Inoue A, Kobayashi K, Sugawara S, Oizumi S, Isobe H, Gemma A, Harada M, Yoshizawa H, Kinoshita I, Fujita Y, Okinaga S, Hirano H, Yoshimori K, Harada T, Ogura T, Ando M, Miyazawa H, Tanaka T, Saijo Y, Hagiwara K, Morita S, Nukiwa T; North-East Japan Study Group. Gefitinib or chemotherapy for non-small-cell lung cancer with mutated EGFR. N Engl J Med 2010;362:2380-8. 27. Iressa [package insert]. Wilmington, DE: AstraZeneca; 2003. Available from: https://www.accessdata.fda.gov/drugsatfda_docs/nda/2003/21-399_IRESSA_Clinr.pdf. [Last accessed on June 26, 2017]. 28. US Food and Drug Administration. FDA approves targeted therapy for first-line treatment of patients with a type of metastatic lung cancer. Available from: https://www.fda.gov/NewsEvents/Newsroom/PressAnnouncements/ucm454678.htm. [Last accessed on December 20, 2016]. 29. Fukuoka M, Wu YL, Thongprasert S, Sunpaweravong P, Leong SS, Sriuranpong V, Chao TY, Nakagawa K, Chu DT, Saijo N, Duffield EL, Rukazenkov Y, Speake G, Jiang H, Armour AA, To KF, Yang JC, Mok TS. Biomarker analyses and final overall survival results from a phase III, randomized, open-label, first-line study of gefitinib versus carboplatin/paclitaxel in clinically selected patients with advanced non-small-cell lung cancer in Asia (IPASS). J Clin Oncol 2011;29:2866-74. 30. Zhou C, Wu YL, Chen G. Erlotinib versus chemotherapy as first-line treatment for patients with advanced EGFR mutation-positive non-small-cell lung cancer (OPTIMAL,CTONG-0802): a multicentre, open-label, randomised, phase 3 study. Erlotinib versus chemotherapy as first-line treatment for patients with advanced EGFR mutation-positive non-small-cell lung cancer (OPTIMAL,CTONG-0802): a multicentre, open-label, randomised, phase 3 study. Lancet Oncol 2011;12:735-42. 31. Rosell R, Carcereny E, Gervais R, Vergnenegre A, Massuti B, Felip E, Palmero R, Garcia-Gomez R, Pallares C, Sanchez JM, Porta R, Cobo M, Garrido P, Longo F, Moran T, Insa A, De Marinis F, Corre R, Bover I, Illiano A, Dansin E, de Castro J, Milella M, Reguart N, Altavilla G, Jimenez U, Provencio M, Moreno MA, Terrasa J, Muñoz-Langa J, Valdivia J, Isla D, Domine M, Molinier O, Mazieres J, Baize N, Garcia-Campelo R, Robinet G, Rodriguez-Abreu D, Lopez-Vivanco G, Gebbia V, Ferrera-Delgado L, Bombaron P, Bernabe R, Bearz A, Artal A, Cortesi E, Rolfo C, Sanchez-Ronco M, Drozdowskyj A, Queralt C, de Aguirre I, Ramirez JL, Sanchez JJ, Molina MA, Taron M, Paz-Ares L; Spanish Lung Cancer Group in collaboration with Groupe Français de Pneumo-Cancérologie and Associazione Italiana Oncologia Toracica. Erlotinib versus standard chemotherapy as first-line treatment for European patients with advanced EGFR mutation-positive non-small-cell lung cancer (EURTAC): a multicentre,open-label, randomised phase 3 trial. Lancet Oncol 2012;13:239-46. 32. Yang JC, Hirsh V, Schuler M, Yamamoto N, O'Byrne KJ, Mok TS, Zazulina V, Shahidi M, Lungershausen J, Massey D, Palmer M, Sequist LV. Symptom control and quality of life in LUX-Lung 3: a phase III study of afatinib or cisplatin/pemetrexed in patients with advanced lung adenocarcinoma with EGFR mutations. J Clin Oncol 2013;31:3342-50. 33. Wu YL, Zhou C, Hu CP, Feng J, Lu S, Huang Y, Li W, Hou M, Shi JH, Lee KY, Xu CR, Massey D, Kim M, Shi Y, Geater SL. Afatinib versus cisplatin plus gemcitabine for first-linetreatment of Asian patients with advanced non-small-cell lung cancer harbouring EGFR mutations (LUX-Lung 6): an open-label, randomised phase 3 trial. Lancet Oncol 2014;15:213-22. 34. Yang JCH, Sequist LV, Geater SL, Tsai CM, Mok TSK, Schuler M, Yamamoto N, Yu CJ, Ou SHI, Zhou C, Massey D, Zazulina V, Wu YL. Clinical activity of afatinib in patients with advancednon-small-cell lung cancer harboring uncommon EGFR mutations: a combined post-hocanalysis of LUX-Lung 2, LUX-Lung 3, and LUX-Lung 6. Lancet Oncol 2015;16:830-8. 35. Sequist LV, Yang JC, Yamamoto N, O'Byrne K, Hirsh V, Mok T, Geater SL, Orlov S, Tsai CM, Boyer M, Su WC, Bennouna J, Kato T, Gorbunova V, Lee KH, Shah R, Massey D, Zazulina V, Shahidi M, Schuler M. Phase III study of afatinib or cisplatin plus pemetrexed in patients with metastatic lung adenocarcinoma with EGFR mutations. J Clin Oncol 2013;31:3327-34. 36. Yang JC, Wu YL, Schuler M, Sebastian M, Popat S, Yamamoto N, Zhou C, Hu CP, O'Byrne K, Feng J, Lu S, Huang Y, Geater SL, Lee KY, Tsai CM, Gorbunova V, Hirsh V, Bennouna J, Orlov S, Mok T, Boyer M, Su WC, Lee KH, Kato T, Massey D, Shahidi M, Zazulina V, Sequist LV. Afatinib versus cisplatin-based chemotherapy for EGFR mutation-positive lung adenocarcinoma (LUX-Lung 3 and LUX-Lung 6): analysis of overall survival data from two randomised, phase 3 trials. Lancet Oncol 2015;16:141-51. 37. Ramalingam SS, Yang JCH, Lee CK, Cantarini M, Frewer P, Ghiorghiu S, John T, Janne PA, Kim DW, Kurata T, Nogami N, Ohe Y, Rukazenkov Y. AZD9291, a mutant-selective EGFR inhibitor, as first-line treatment for EGFR mutation-positive advanced non-small cell lung cancer (NSCLC): results from a phase 1 expansion cohort. J Clin Oncol 2015;33 suppl:abstr 8000.